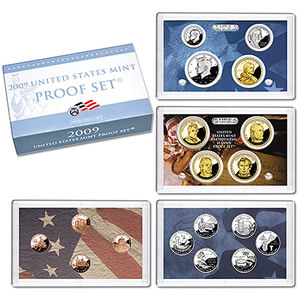 The US Mint on Monday launched the 2009 Proof Set. The annual set is priced higher this year at $29.95, but it also includes specially minted pennies and four more coins. The 2009 proof set is highlighted with redesigned Lincoln cents that celebrate the bicentennial birth of Abraham Lincoln. And unlike the circulating penny versions, each is composed of alloy matching the original 1909 Lincoln cent — 95% copper, 3% zinc and 2% tin. The pennies alone are likely to make the 2009 sets more popular than past years, and that is saying much. The annual sets are always a favorite with collectors — each proof coin strike features the San Francisco "S" mint mark. More than 1.4 million of the 2008 proof sets were sold. Over 1.7 million of the 2007 proof sets were purchased. While these prior sets were priced at $26.95, the 2009 proof sets costs $29.95. The price increase may be attributed to the specialized pennies and the extra quarter due to this year’s DC & US Territories Quarters Program. The 2009 proof set is just five cents more than combining both of the above products. Plus, it includes 8 more coins. "Extraordinarily brilliant, with sharp relief and a mirror-like background. Their frosted, sculpted foregrounds give them a special cameo effect. Proof blanks are specially treated, polished and cleaned to ensure high-quality strikes. The blanks are then fed into presses fitted with specially polished dies and struck at least twice to ensure sharp relief. The coins are then packaged in protective lenses to showcase and maintain their exceptional finish." Sets may also be purchased through the Mint’s toll-free number, 1-800-USA-MINT (872-6468). Hearing and speech-impaired customers may order by calling 1-888-321-MINT (6468). Um… not to pick nits, but I think you meant the 1909 Lincoln cent. If there was a 1907 Lincoln cent, it would be worth a fortune!! Does anyone know if there will also be a silver proof set? The US Mint hasn’t set a specific date for the silver proof set release other than “summer.” The price is expected to be $52.95. Another question: do most serious collectors purchase the regular proof set or the silver proof set or both? Which one is the best long-term investment? they should make copper cents in 2010 too. i got the 2009 proof set and one of the pennies does not have the S mint mark but the others do,i wonder if other sets have one penny without an mint mark and i wonder how much is my set worth. Does anyone know what the deal on the 2008 clad proof set is. why it is so high and getting higher.